(C) 2011 WARNER BROS. ENTERTAINMENT INC. TM&(C)DC COMICS. 『 ザ・ブレイン (2000)<未> 出演 ? 【「グリーン・ランタン」ネタバレ／あらすじ結末まで完全ネタバレ英語版】#01　Millions of years before the Earth was formed, a group of beings called the Guardians of the Universe used the green essence of willpower to create an intergalactic police force called the Green Lantern Corps. 【「グリーン・ランタン」ネタバレ／あらすじ結末まで完全ネタバレ英語版】#02　They split the universe into 3,600 sectors, with one Green Lantern per sector. One such Green Lantern, Abin Sur (Temuera Morrison) of Sector 2814, defeated the fear-essence being Parallax (voiced by Clancy Brown) and imprisoned him in the Lost Sector on the ruined planet Ryut. 【「グリーン・ランタン」ネタバレ／あらすじ結末まで完全ネタバレ英語版】#03　However, in the present day, Parallax escapes from his prison. Six months later, after killing four Green Lanterns and destroying two planets, Parallax attacks Sector 2814 and mortally wounds Abin Sur, who escapes and crash-lands on Earth. 【「グリーン・ランタン」ネタバレ／あらすじ結末まで完全ネタバレ英語版】#04　The dying Abin Sur commands his ring to find a worthy successor on the planet. 【「グリーン・ランタン」ネタバレ／あらすじ結末まで完全ネタバレ英語版】#05　Ferris Aircraft test pilot Hal Jordan (Ryan Reynolds) is chosen by the ring and transported to the crash site, where Abin Sur appoints him a Green Lantern, by telling him to take the lantern and speak the oath. 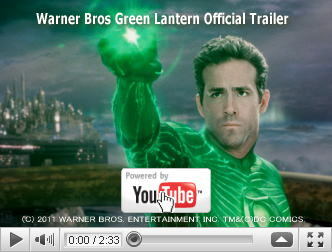 【「グリーン・ランタン」ネタバレ／あらすじ結末まで完全ネタバレ英語版】#06　At home he says the oath of the Green Lanterns while under trance from the glow of the lantern. 【「グリーン・ランタン」ネタバレ／あらすじ結末まで完全ネタバレ英語版】#07　After he gets attacked while leaving a bar Jordan swings to punch one of his attackers, letting out a huge fist of green energy, afterwards Jordan is whisked away to the Green Lantern Corps home planet of Oa, where he meets and trains with Tomar-Re (voiced by Geoffrey Rush) and Kilowog (voiced by Michael Clarke Duncan). 【「グリーン・ランタン」ネタバレ／あらすじ結末まで完全ネタバレ英語版】#08　He encounters Corps leader Sinestro (Mark Strong), who is not pleased that a human?which is primitive compared to other species?has become a Green Lantern. With Sinestro seeing him as unfit and fearful, Jordan quits and returns to Earth, keeping the power ring and lantern. 【「グリーン・ランタン」ネタバレ／あらすじ結末まで完全ネタバレ英語版】#09　Meanwhile, after being summoned by his father Senator Robert Hammond (Tim Robbins) to a secret government facility, scientist Hector Hammond (Peter Sarsgaard) performs an autopsy on Abin Sur's body. 【「グリーン・ランタン」ネタバレ／あらすじ結末まで完全ネタバレ英語版】#10　A piece of Parallax inside the corpse inserts itself inside Hammond, mutating the scientist and giving him telepathy and telekinetic powers, at the cost of his sanity. 【「グリーン・ランタン」ネタバレ／あらすじ結末まで完全ネタバレ英語版】#11　After discovering that he was only chosen due to his father's influence, Hammond resentfully attempts to kill his father by telekinetically sabotaging his helicopter at a party. 【「グリーン・ランタン」ネタバレ／あらすじ結末まで完全ネタバレ英語版】#12　However, Jordan uses his ring to save the senator and the party guests?including his childhood sweetheart, Ferris manager and fellow test pilot Carol Ferris (Blake Lively), who later recognizes Jordan under the suit and mask. 【「グリーン・ランタン」ネタバレ／あらすじ結末まで完全ネタバレ英語版】#13　Shortly afterward, Jordan encounters Hammond, who succeeds in his second attempt to kill his father by burning him alive. Both Jordan and Hammond realize Parallax is on his way to Earth. 【「グリーン・ランタン」ネタバレ／あらすじ結末まで完全ネタバレ英語版】#14　Back on Oa, the Guardians tell Sinestro that Parallax was once one of their own, until he desired to control the yellow essence of fear, only to become the embodiment of fear itself. 【「グリーン・ランタン」ネタバレ／あらすじ結末まで完全ネタバレ英語版】#15　Believing the only means to fight fear is by fear itself, Sinestro requests for the Guardians to forge a ring of the same yellow power, preparing to concede Earth's destruction to Parallax in order to protect Oa. 【「グリーン・ランタン」ネタバレ／あらすじ結末まで完全ネタバレ英語版】#16　However, Jordan appears and tells Sinestro not to use the yellow ring and for the Corps to help him protect his planet from Parallax's imminent invasion. They deny his request, but allow Jordan to return and protect his home planet. 【「グリーン・ランタン」ネタバレ／あらすじ結末まで完全ネタバレ英語版】#17　Upon returning to Earth, Jordan saves Ferris from being injected with Parallax's essence by Hammond. Parallax then arrives, consuming Hector's life force for failing to kill Jordan, and then wreaking havoc on Coast City. 【「グリーン・ランタン」ネタバレ／あらすじ結末まで完全ネタバレ英語版】#18　Jordan lures Parallax away from Earth and toward the Sun, using the Sun's gravity to pull and disintegrate the entity. He loses consciousness after the battle, but is saved by Sinestro, Kilowog, and Tomar-Re before the entire Green Lantern Corps congratulates him for his bravery. 【「グリーン・ランタン」ネタバレ／あらすじ結末まで完全ネタバレ英語版】#19　Sinestro tells Jordan he now bears the responsibility of protecting his sector as a Green Lantern. 【「グリーン・ランタン」ネタバレ／あらすじ結末まで完全ネタバレ英語版】#20　Sometime later when he is alone, Sinestro, still in possession of the yellow ring, places it on his finger, causing his green suit to change to yellow.